Doing small and simple usability studies usually give you a great return on investment - testing as little as 5 subjects can yield up to 85% of all usability problems on a site according to a study by Jakob Nielsen. So how do you prepare for your own web usability study? 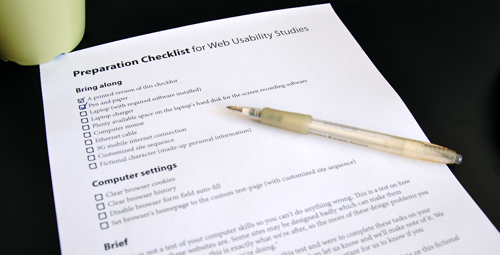 A copy of the preparation checklist we used for our latest usability study. Below is the preparation checklist we, here at Baymard Institute, went through before conducting each test in our latest web usability study. My comments are in [brackets]. If you want an easy printable version, then I’ve made a .PDF version you can use (without the comments). Note: you should obviously add items as your study prescribes it, this is only meant as inspiration and/or a starting point. What du you think of this way to do a research design? Do you have any other important things to remember? Note: we’ve removed certain items from the above lists that were specific to the study we were conducting. Authored by Christian Holst. Published on January 26, 2010. No comments yet – write one!